While anti-piracy company MediaDefender only got involved in hindering downloaders, BayTSP is the outfit that tracks file-sharers and sends infringement notices to ISPs. Using cumulative data from its entertainment industry clients, the company reveals which nation's sharers get caught infringing the most. Anti-piracy company BayTSP works with the entertainment industry to track down illicit file-sharers, monitor them and gather evidence in order to issue infringement notices to their ISP, i.e stop downloading – or else. In addition, the company gathers intelligence for clients who want to see where their content is appearing, to understand the scope of it all. BayTSP has used the data it collected on behalf of its clients to produce its just released Online Trends & Insights 2008 report and there are some quite interesting findings. The report notes that BitTorrent has further strengthened its dominant position as the protocol used to infringe the most copyrights, with eDonkey (eD2k) in second place. It has to be noted that BitTorrent may be more actively and easily monitored than Usenet and other file-sharing platforms, and that this resulted in more recorded infringements. “BitTorrent and eDonkey are optimized for large file distribution and despite the growing popularity of streaming video, are still where the majority of copyright infringement takes place,” said BayTSP CEO Mark Ishikawa in a comment on the report. In terms of P2P infringement location, BayTSP also claims that despite topping the list of most-infringing countries in 2007, the United States has seen the number of infringements fall ever since, pushing it down into 4th position. Copyright infringement on file-sharing networks has surged in Europe, helping France move up to 3rd place in the piracy league. A single ISP, France Telecom, clocked up more than 2 million logged infringements. 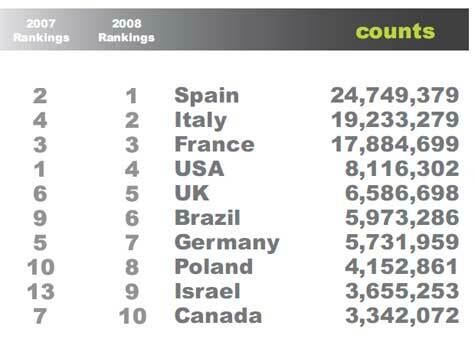 Second place went to Italy and one of its ISPs, Telecom Italia, also reached over 2 million infringements. The title of most-infringing country goes to Spain, with ISP Telefonica De Espana playing host to more than 2 million infringements. The report also reveals that BayTSP sent more than a million infringement notices each to Comcast, AT&T and Road Runner in 2008. Comcast had the most copyright infringements of all ISPs in the US, 1,668,738 in total during 2008. Finally, the report discovered another interesting trend. 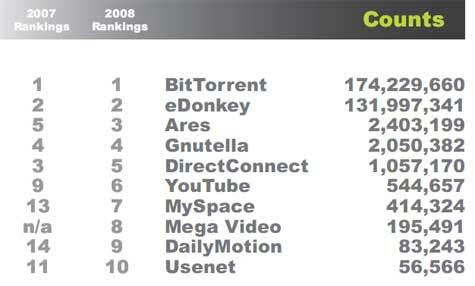 The median download time for a TV-show is much shorter on BitTorrent than on eDonkey. With BitTorrent it takes roughly 10 hours while eDonkey users may have to wait a full 4 days before their download is complete.